Every project has a life cycle, and project management life cycles have four stages. 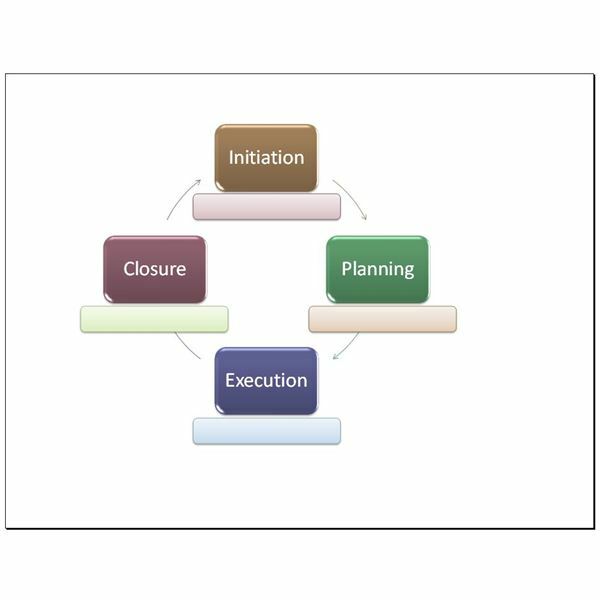 The Initiation phase is the period during which you identify the nature and scope of the project. During the Planning stage, you determine details such as the budget, resources and amount of time you will need for the project. The Execution phase comprises the actual procedures that the team must carry out to complete the project and the Closure stage is the formal completion of the project, which leads back to the Initiation phase of the next project. 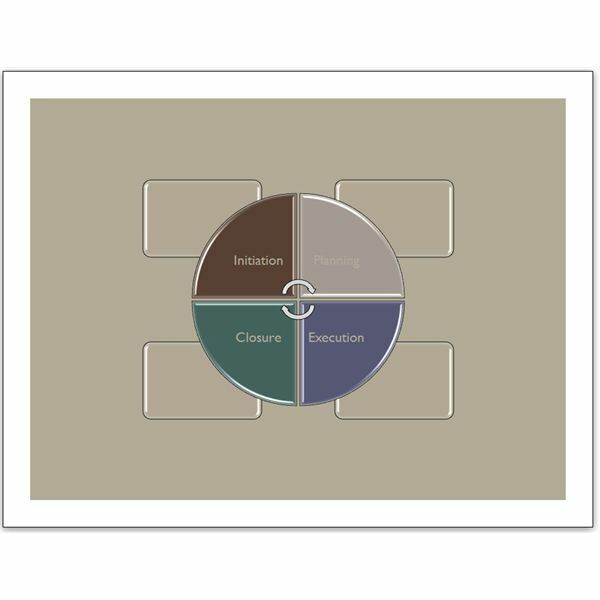 The simplest way to create a project management life cycle is to use a template. Following are four templates you can use in Word, Excel, Publisher and PowerPoint. Customize them to suit your needs for all of your projects. Note: Clicking on the download link will open up a page in Google Drive where you can download the corresponding template. Previews are not always accurate, so view the images for an idea of what the template looks like. This template combines a SmartArt graphic with shapes and text boxes. The radial Venn diagram base of the template includes four circles surrounding another circle. Each circle contains one of the four life cycle stages, although you can change the text if you choose to. 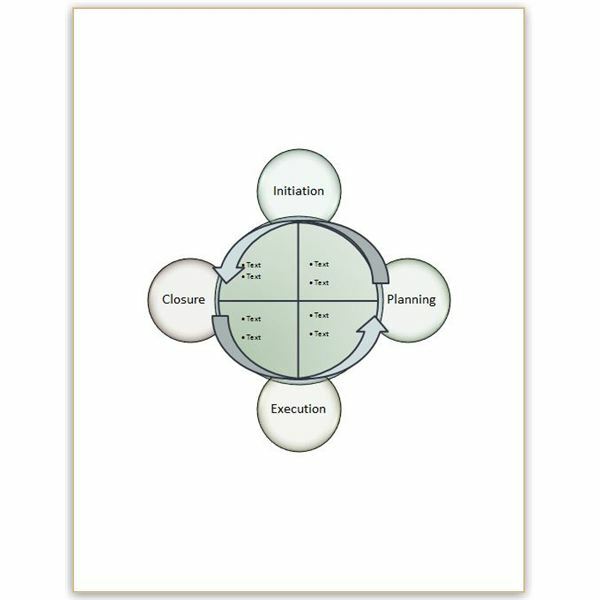 A divided circle placed in the center contains text boxes with bullet points into which you can type details regarding each stage in the cycle. You can change the appearance of the template, as well. Select the SmartArt graphic and click on the Design tab under SmartArt Tools. Click Change Colors and choose a different style or select another option from the SmartArt Styles gallery. In addition, you can change the color theme for more options. Click on the Design tab in Word 2013 or the Page Layout tab in Word 2007 or 2010 and choose the theme you want to use. You can use the Excel template to add to an existing workbook or as a standalone worksheet. This template is a combination of a SmartArt image and basic shapes. The Block Cycle design displays the life cycle of a project in four polished, beveled blocks connected with thin corresponding arrows. Each block has another rectangle associated with it into which you can type any details you choose. You can change the appearance of the template by choosing Change Colors and selecting a different style or picking another option from the SmartArt Styles gallery on the Design tab under SmartArt Tools. Change the color theme for more options. Microsoft Publisher does not offer SmartArt graphics, so this template contains a group of shapes that make the project life cycle. The page title is a WordArt object. To change the text or appearance, click on the title and select the Format tab under WordArt Tools. Click Edit Text to change the text or choose another style. Type your text into the bulleted lists in the text boxes. In order to change the colors on the template, you must select each individual box, select Format tab under Drawing Tools and choose different fill or line colors. The base of the cycle is an image, so you can recolor the entire object by selecting it, clicking the Format tab under Picture Tools and choosing Recolor. 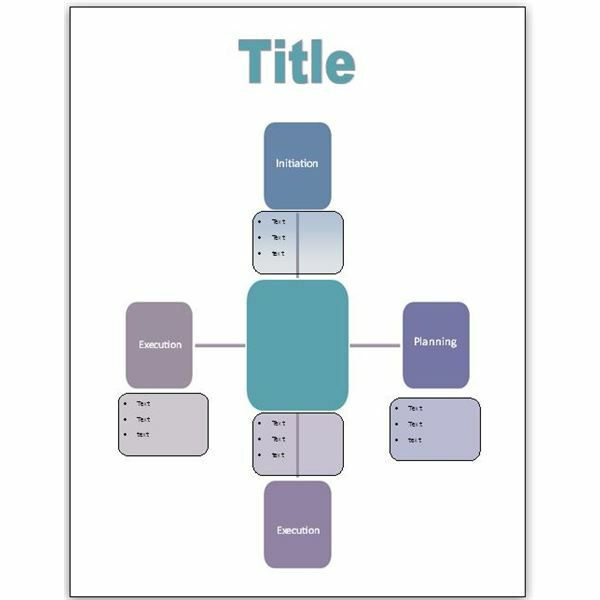 Use this template to add your project management life cycle to a new or existing PowerPoint presentation or as a standalone image. The Cycle Matrix SmartArt graphic has a pie-like circle in the center with text boxes alongside each stage into which you can type details regarding each stage in the cycle. To change the appearance of the template, select the SmartArt graphic and click on the Design tab under SmartArt Tools. Click Change Colors and choose a different style or select another option from the SmartArt Styles gallery. In addition, you can change the color theme for more options. Click on the Design tab in Word 2013 or the Page Layout tab in Word 2007 or 2010 and choose the theme you want to use.